Iowa State coach Paul Rhoads has been a part of several rivalries but says none match the feeling of the annual showdown with the Iowa Hawkeyes. Rhoads has been a part of the Ohio State-Michigan, Auburn-Alabama and Pitt-West Virginia rivalries and this Saturday’s matchup will mark the sixth time he has been part of the rivalry with the Hawkeyes. Rhoads says this series is much different than the others he has been a part of as it is a different kind of rivalry that is “competitively friendly” while he says some of the other games have hate involved. He says people move on after this game and that’s what makes it so great. Rhoads says their feelings about this year’s Iowa team have not changed despite The Hawkeyes one point victory over UNI. He says the Hawkeyes are nationally ranked and deserving of that ranking and the kids play each other and know how physical Iowa is and the Hawkeye tradition of winning. This will be Rhoads first matchup with Iowa as head coach and he says he doesn’t know if it will mean any more than the others. 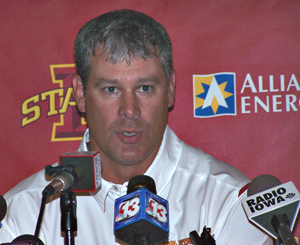 The Cyclones opened with a 34-17 win over North Dakota State and Rhoads says it was a good start for his team. He says the effort was outstanding as they have very few players loafing, something he says is rare in a first game. North Dakota State and Iowa have similar styles on offense and Rhoads says that will be a benefit in preparation. He says that allows them to continue practicing things they worked on the week before. ISU’s new “spread” offense posted more than 440 yards in the opener, including 204 on the ground. Rhoads says they were pleased with the 200-plus rushing yards and says it’s hard to plan for a quarterback that can run the ball like they do. 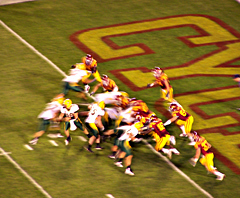 Iowa State quarterback Austen Arnaud calls the annual game against Iowa the biggest sporting event of each year in the state. The Ames native will lead the Cyclones when the teams meet for the 57th time this Saturday in Ames. He says without any pro sports teams, the fans flock to the rivalry. Arnaud says the season opening victory over North Dakota State was a good start but says the offense needs to improve this week. He says he did not play well in the first half and some of that was jitters, but he says he hopes to improve on that. Arnaud says he does not expect to see a different Iowa defense than in past years, as he says they stay with what they are good at and they are good at what they do. Iowa State has won two in a row at home over the Hawks and Arnaud says that helps give them confidence. Arnaud says they can play with anybody if they are focused.